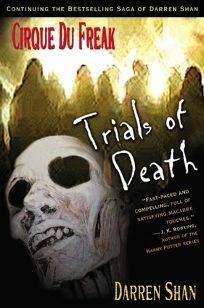 The Cirque Du Freak saga continues in a fifth installment, Trials of Death by Darren Shan. Once again the protagonist takes readers into the heart of the vampire world, where he must face the Trials of Initiation to prove himself worthy of being a half-vampire-or die trying. The gory tale ends with a ""to be continued"" teaser and an excerpt from book six.